From behind the walls of a handful of well-hidden, unlikely recording studios in the Los Angeles area, legends-in-waiting created masterpiece albums. It was a time of astonishing creativity and unprecedented fame and fortune. It was also a time of unfettered excess that threatened to unravel everything along the way. 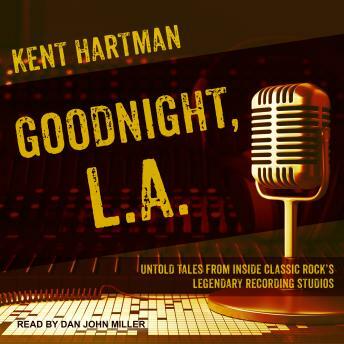 With access that only a longtime music business insider can provide, Kent Hartman packs Goodnight, L.A. with never-before-told stories about the most prolific time and iconic place in rock 'n' roll history. He brings the stories to life through new in-depth interviews with classic rock artists and famous producers. What Hartman's The Wrecking Crew was to pop singles, AM radio, and the '60s, Goodnight, L.A. is to album cuts, FM radio, and the high-flying, hard-rocking '70s and '80s.